Mitsubishi sold 103,686 vehicles in the U.S. in 2017. That’s an 7.7 percent increase over the previous year. 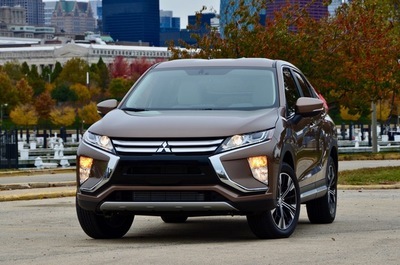 And now as we roll in to the last month of 2018, Mitsubishi reported calendar year sales through November of 109,088 units sold. That’s an increase of 14.6 percent over the same period in 2017. Mitsubishi has been producing cars for over 100 years. This year new U.S. corporate leadership has been put in place with the desire to refocus the brand and better support its 360 dealers. However, you need product to be successful and the newest entry in the model range is the Eclipse Cross, a two-row compact SUV introduced for 2018. It’s namesake is the Eclipse sports car from the 1990s that was one of Mitsubishi's best-selling, iconic vehicles. In size, the Eclipse Cross fits in between the two-row Outlander Sport and the three-row Outlander. The compact SUV segment is very crowded with many formidable entires from all the major brands. There’s something for everyone. 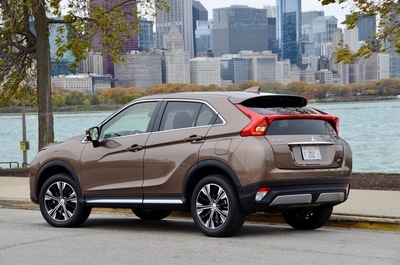 Price is all-important and the Eclipse Cross is well positioned with a starting price of $23,595 making it attractive to young adults who are just getting started in their careers. The Eclipse Cross is offered in ES, LE, SE and SEL trims. The ES comes in both front-drive or with Mitsubishi’s S-AWC all-wheel drive, which is standard on the three upper trims. The Eclipse Cross is basically unchanged for 2019 except for the addition of gloss black window switch panels on the LE and a new accessory roof rail system across all trims. For my drive evaluation I was in an SE trim priced at $26,695. The only engine is a 152-HP turbo 1.5-L 4-cylinder that is matched up to an 8-speed CVT. For the LE, SE and SEL trims, EPA test-cycle fuel economy ratings are 25 mpg combined with 25 city mpg and 26 highway mpg. ES trims have slightly better ratings. The S-AWC all-wheel drive has three driver-selectable modes—AUTO, SNOW, GRAVEL, to enhance performance depending on the driving conditions. Around my Chicago home the Eclipse Cross did okay getting me from stop sign to stop sign. Its turbo engine makes for good acceleration and has plenty pf pep. Highway merging is okay too. However, load it up with lots of people and things or travel in hilly terrain and it will need to work a bit harder to deliver the performance you might want. The Eclipse Cross also handled Chicago’s streets fairly well with decent ride comfort. However, on a jaunt out of the city on some twisty suburban roads and around highway cloverleafs handling could have been a bit more refined. The cabin with its seating for five provides decent comfort. 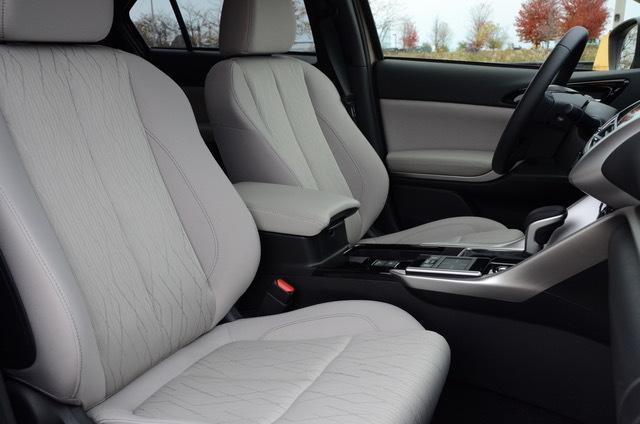 The rear seat reclines and slides making for more rear seat passenger comfort as needed. Behind the 60/40-split rear seat is 22.6 cu.ft. of cargo space that more than doubles to 48.9 cu.ft. with the rear seat folded. Standard is a 7-inch touch screen that also uses a touch pad, as well as HD Radio, Bluetooth and four speakers. 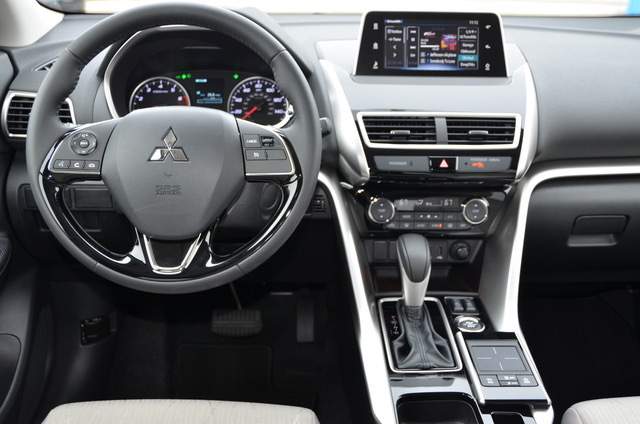 Other available features include Apple CarPlay and Android Auto, satellite radio and new Mitsubishi Connect telematics system to call emergency and road-side assistance. An SEL Touring Package includes a 70-watt Rockford-Fosgate premium audio system with 9-speakers, heated steering wheel and rear seats as well as power sunroof. Driver assistance safety features include a standard rearview camera and an available multi-view camera. On the upper two trims, a head-up display, blind spot monitoring, lane change assist, rear cross traffic alert, automatic high beams, forward collision mitigation, lane departure warning, adaptive cruise control, and rain-sensing windshield wipers are offered. The Eclipse Cross is somewhat distinctive in its exterior design with its narrow headlamps and large lower turn signal/fog light. Side sculpture character lines lead to the rear with taillights that form a light-bar dividing the rear hatch glass. At 173.4 inches long the Eclipse Cross is easy to maneuver in a crowded city. With the trend towards re-urbanized living, especially for millennials, this is a factor to consider. More information, specs and features can be found at www.mitsubishicars.com. I also drove the Eclipse Cross on some mild off-road trails where it showed off its abilities. I wouldn’t suggest rock crawling. But, for a weekend of camping or hiking the Eclipse Cross with its AWD system will handle the dirt trails to most campsites. My off road drives happened at Road America in Elkhart Lake, Wisconsin at the Midwest Automotive Media Association (MAMA) Spring Rally. This event brings together new vehicle makers and automotive journalists and provides the opportunity to do some out-of-the-ordinary driving. 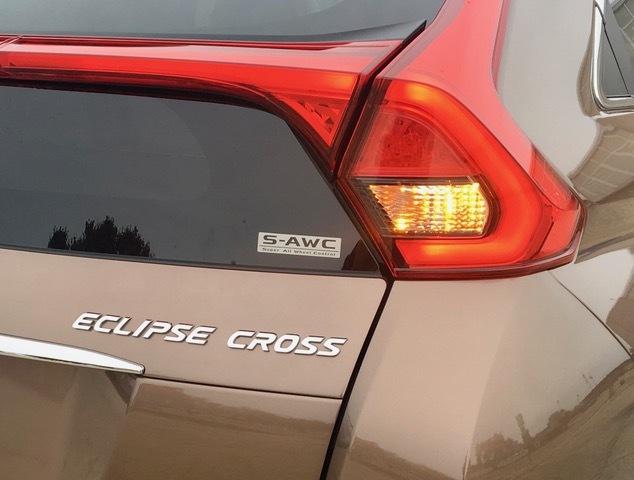 The Eclipse Cross is a candidate for MAMA’s Family Vehicle of the Year award. 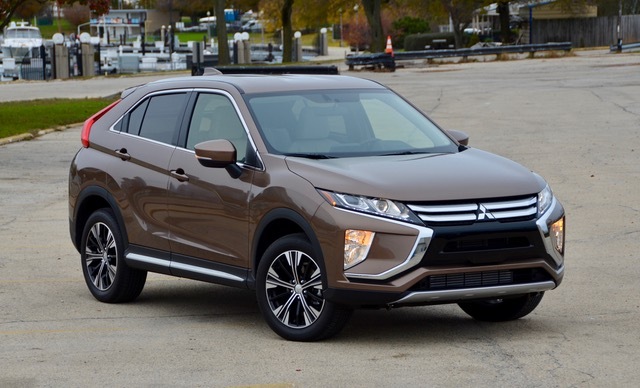 The 2019 Mitsubishi Eclipse Cross offers good value plus it has a long warranty—-five-year/60,000-mile warranty and 10-year/100,000-mile powertrain warranty. These two factors alone may satisfy many and make it the right purchase. Mitsubishi is on track to have another record sales year and the Eclipse Cross is a good contributor to that.